Welcome to this review of a prominent VPN service for Mac, NordVPN. In this article we will review many aspects of the service, such as ease of use, features and price. The first thing to notice about NordVPN is that when you open it up instead of a list of servers you are presented with a map, the countries of which you can click on to connect to servers there. This is extremely easy and user-friendly to operate — NordVPN can be used with virtually no understanding of what a VPN is, because it makes a graphical representation of moving around to different countries. It is possible of course to change the view using a button the upper right-hand corner of the screen, to give you a more conventional list of servers with more information. Servers can be sorted by name, load and distance, and NordVPN will show you exactly which servers are better for which purposes. There are servers designed to be used with TOR, for P2P file-sharing, some for the fast streaming of video and others for extra privacy. This is something that is not common with other VPN providers. In this review we used the Mac client for NordVPN because this is a Mac website — however like most providers NordVPN also offers a client for Windows, iOS and Android. Although I must say that the Windows client’s interface does not look as good as the Mac one — you just have a regular list of servers rather than the pretty map. 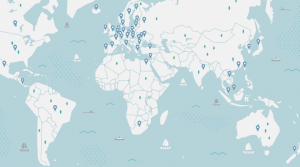 NordVPN has 550 servers in 47 countries, which covers most locations you’d want a VPN for. Africa, South/Central America and the Middle East are places where there are few NordVPN servers, however due to the Internet infrastructure and/or political regimes in many of these areas they are locations where most people would not find a VPN particularly useful. Having said that there are other VPN providers who do have servers in some of these places, so variety in terms of countries is not NordVPN’s strongest point. NordVPN itself is based in Panama, a country with very privacy-orientated legal provisions. This puts it at a big advantage to providers based in locations such as the U.K where the logging of VPN activity is legally mandated. NordVPN does not keep any logs, which ensures privacy from governments as well as businesses, hackers, scammers etc. Speed using NordVPN is comparable to other providers — it isn’t the fastest speed out there, but it’s still good. Of course the speed will vary a lot depending on what country you’re in and which server you are trying to connect to. The price of a NordVPN subscription varies depending on the length of the subscription you purchase. On a per month basis buying a 1 month plan costs the most, a 6 month plan costs 41% less and a one year plan costs 52% less. At the moment this means a one year plan would work out to just over $5.00 a month, which is very reasonable and is one of the lower prices out there when it comes to VPN providers. NordVPN has a 30 day money back guarantee, so don’t be shy about going for the 1 year plan to maximise savings! If you don’t end up liking NordVPN for whatever reason they are reasonable when it comes to giving out refunds. In conclusion I would say that NordVPN is great value for money if you want a VPN for the long term with a high level of security and you don’t mind not having severs in some obscure countries. If you have decided you would like to try NordVPN check out the plans here. For any questions regarding NordVPN you can check out their FAQ, their support or post in the comments section below.